No one really likes doing household chores but the fact remains that they need to be done, and for the sake of our homes, and the health of our family they should also probably be done well, right? You have choices when it comes to how you clean your home, and actually, there are quite a few options out there, which can make it kind of difficult when deciding which one is right for you. There is nothing wrong with traditional mopping, but there are also better options out there. Today we will be going over why steam cleaning might actually be a better option for your home and family. Read on for a guide to steam cleaning Vs. traditional mopping! First What is Steam Cleaning? 1 First What is Steam Cleaning? 4 How’s it Different in Between Steam Cleaning Versus Traditional Mopping? Good question! We will now go over exactly how steam cleaning works in order to help you to determine if it is right for you. One of the primary benefits of the steam cleaner is that it is entirely natural. There are no harsh chemicals that can be both bad for your family members and bad for the surfaces of your home. In fact, there are no supplemental products or costs at all that you need to worry about buying in order to use your steam cleaner. As the name suggests this tool is powered by steam. To get started with it, you just fill up the tank and allow it to heat up. Using the steam cleaner is pretty simple. Once you have filled and heated up the tank it is really just a matter of applying the steam to whatever surface that you are trying to clean. A general rule of thumb is to move the nozzle of the steam cleaner about one inch a second so that you don’t linger on any one spot for too long. You will also want to dress appropriately in sleeves and rubber gloves to avoid skin exposure to the hot steam. Another beautiful thing about the steam cleaner is that you can use it in almost any room or on any surface of your home. It works on tile, on counters, on curtains and carpets, and even car interiors. Really, the only surface of your home that it doesn’t work well with is hardwood floors. In addition to being versatile and free of all chemicals, the other chief benefit of the steam cleaner is that it is also extremely effective. 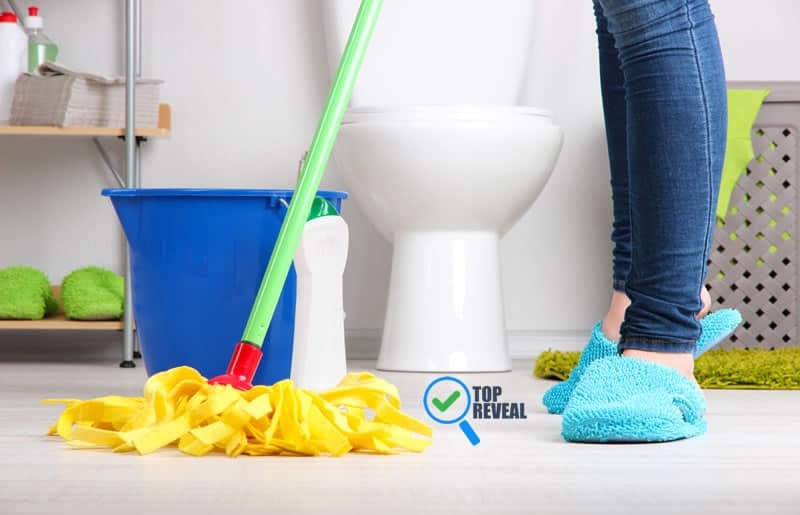 The heat of the steam does very well to eliminate all germs and bacteria so that your floors are getting a clean that traditional mops simply cannot deliver. Additionally, the steam cleaner is also excellent at lifting dirt and grime so that it can be easily wiped away. Then, of course, there is traditional mopping, which we will also break down. You know how to mop the traditional; way, right? It’s pretty simple. You fill a bucket with water and a cleaning solution, you soak your mop, ring it out, and then apply the cleaning products to the surface of your choosing. You are going to have a little bit of choice in terms of what you use when it comes to old way mopping. There are plenty of different solution options out there, some of which are more natural than others. Unfortunately, this tool is not quite as versatile as the steam cleaner. Traditional mops are pretty much limited to tile. Traditional mopping is not without its benefits as well. For one thing, given the nature of the motion, it does a good job of actually collecting dirt, rather than just loosening it from the surface the way that steam mopping does. For another thing, the soapy solutions that are used for mopping do leave your tile floors smelling nice and fresh. The basics of steam cleaning and mopping are pretty similar. Both methods of cleaning can be done on tiled surface to eliminate dirt and grime. However, it is pretty much there that the similarities end. How’s it Different in Between Steam Cleaning Versus Traditional Mopping? We will now take a look at the differences between steam cleaning and traditional mopping to see which method is right for your home. One of the biggest differences between mopping and steam cleaning is the need to use chemicals. As mentioned earlier, steam cleaning uses only water, which will eliminate the risk of exposing your family to harmful substances. Another thing to consider is that mops don’t actually kill germs and bacteria the way that steam cleaners do. The hot temperatures that are produced by steam cleaners do a great job of sterilizing surfaces so that your home is actually getting the clean that it needs. To mention a point in the favor of the traditional mop, this method of cleaning is actually a lot more efficient at dirt removal. The mop head is able to wipe away dirt and grime in a way that the steam cleaner isn’t able to manage. When you use a steam cleaner you are probably going to need to take the time to actually wipe surfaces down later. It will be easy because the dirt and grime will have been severely loosened but it is also an extra step in the process. Finally, the steam cleaner is a lot more versatile than the mop. While the mop is mostly only good on tile, you can use the steam cleaner on just about any surface in your home besides hard wood flooring. As you can see, steam cleaning really is a special way to clean your floors. There are no dangerous chemicals—the steam cleaner is an all natural and highly effective way to give your home the clean that it deserves. If you want a tool that destroys germs and bacteria and truly changes the way that you tackle dirt and grime, not just on your tile, but on almost any surface in your home, then you know what to do. Invest in a steam cleaner and enjoy better cleans than ever before.